Our in plant facility is fully equipped to provide specialized care and attention for all types of area rugs. This facility is staffed with technicians who are experts in identifying, cleaning and repairing area rugs. Whether you have a fine hand-woven heirloom, or a funky contemporary piece, your special carpet will be carefully cleaned to remove any dirt, stain or odours. 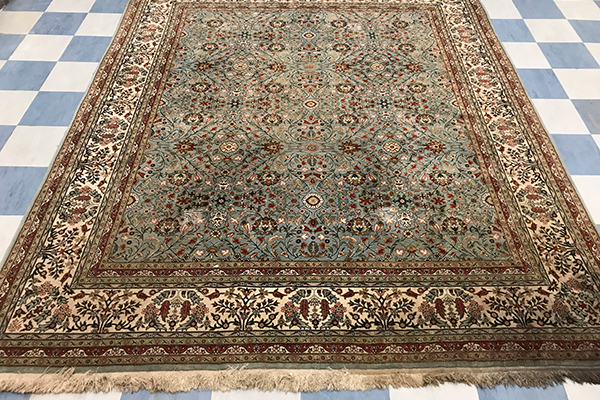 SaniTECH performs a wide range of area rug repairs including: fringe repair and replacement, authentic weave repairs and binding repair or replacement. We tailor our rug cleaning products and techniques to your rug. 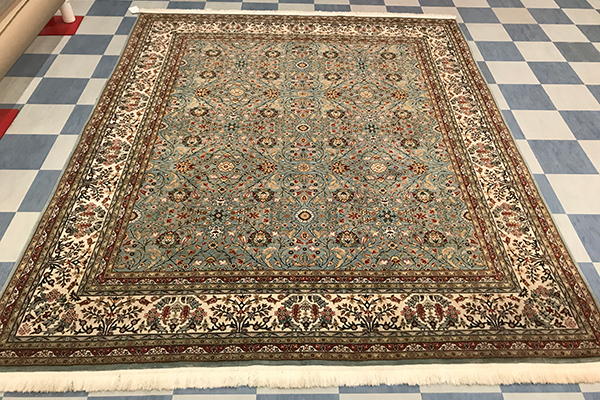 Whether you have a priceless Oriental Rug from Asia or a Persian or Turkish area rug from the middle east, we can help. If you are trusting someone with your heirloom rug, you want them to be able to be a specialist. We are world certified experts in rug dyeing restoration, repair, and tailored cleaning services. When it comes to quality, don’t just take our word for it. We have collected a variety of different reviews that showcase what we do best. Our cleaning process takes on average 5-7 days to complete. The products we use are safe and leave no residue on your rugs. Our cleaning process begins with the use of the Rug Badger line of cleaning equipment. This device vibrates the back of your rug to remove all the fine insoluble soil, dust, allergens from deep within the fibers. We repeat this procedure several times to ensure that your area rugs are restored back to a healthy state. Your rug is then cleaned several tmes and allowed to dry before we repeat the process. Every rug requires special attention, with demands that are specific in nature and relative to each piece. We are trained to handle every type of fiber and construction and use the appropriate method of cleaning. Have questions? Ask us! We are experts in fine Oriental and Persian rugs as well as rugs from Europe and India. We are here to help give you the best advice and service possible. If you are within our service area we are available to pick up and deliver your rug for your convenience. You also have the option of dropping off your rug and picking it up.